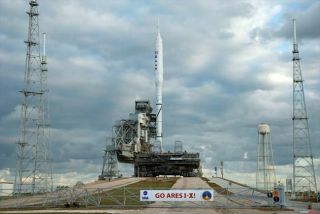 The Ares I-X rocket sits at its Launch Pad 39B at NASA's Kennedy Space Center in preparation for its test launch Oct. 27. WASHINGTON (ISNS) -- When Norman Augustine presented theReview of Human Spaceflight Plans Committee's 154-page report on Thursday, thecommittee chairman left no doubt that the NASA program is in trouble. "The U.S. humanspaceflight program appears to be on an unsustainable trajectory. It isperpetuating the perilous practice of pursing goals that do not match allocatedresources," the report?s opening sentences bluntly stated. Augustine, the former CEO of Lockheed Martin who led alandmark study in 1990 about the future of the U.S. space program, was just asfrank during Congressional testimony after the committee released a summary ofthe report in September. "The current program that is being pursued is notexecutable," he told members of the House Committee on Science andTechnology. "There is a mismatch between the task to be performed and thefunds to support it." The report's basic conclusion is that the current humanspaceflight program -- which is aimed at returningto the moon in the mid-2020s and then moving on to Mars -- will not succeedwithout an additional $3 billion in annual funding. Augustine noted intestimony over the summer that if NASA continues on the current path that wasinitially set by the previous administration in 2004, it will eventually"fall off a cliff" due to lack of funding. The report questions if the current Constellation program isproperly focused, but also notes that no matter which option the governmentselects for moving beyond low-Earth orbit, NASA would need around $30 billionin additional funding over the next decade to for successful human spaceflight. NASA's human spaceflight program is at a crossroads. Almostfour decades since the last astronauts lifted off from thesurface of the moon, the U.S. program has been stuck in low Earth orbit.Much has been learned about building things in space, but little significantscience or true exploration has been done by the astronauts. The grim assessment of the current program was not wellreceived by Rep. Gabrielle Giffords of Nevada, who heard Augustine testify inSeptember. "I am angry," Giffords told him at the time.? Giffords --the only member of Congress married to an astronaut -- said the review not onlyfailed to set a path "to ensure a robust and meaningful human spaceflightprogram," but has also lost ground because of its negative portrayal ofthe current program. The full report released Thursday did little appeaseGiffords. "When Congress wrote and enacted last year's NASAAuthorization Act, it anticipated essentially all of the issues mulled by theAugustine panel this summer," Giffords said. "Congress has alreadymade its decisions on the issues considered by the panel. Everyone knows whatneeds to be done, let's get on with it and cease contemplating our collectivenavels." But the 10 member Augustine panel notes that moving forwardisn't that simple. The Constellation program calls for humans to return to themoon and establish a base there before moving on to Mars. Under that plan, thespace shuttle would be retired in 2010, and the international space station wouldbe deorbited in 2016, dropping into the Pacific Ocean. The AresI rocket is being developed to carry the new Orion spacecraft intolow-Earth orbit to provide service to the ISS after the shuttle program isretired, but inadequate funding and development delays likely mean that Ares Iwon?t be ready for launch until well after the space station is decommissioned. While the final report doesn't make specificrecommendations, Augustine noted that the Ares I isn't needed and the effortsshould shift to a heavy-lift rocket that more adequately fits NASA'slonger-range mission plans. That larger Ares V rocket will do what the oldSaturn rockets did during the Apollo era -- carry humans to the moon. If thefunding problem is solved and humans do establish a presence on the lunarsurface, then NASA would look toward moving on to Mars -- which the report saysis feasible. During Thursday's press conference, Augustine continued topush the panel's flexible path option which calls for considering a host ofmissions using the larger Ares V. Humans could rendezvous witha near-Earth asteroid, orbit Mars, land on one of the two Martian moons oreven visit the Lagrangian Points, stable regions in nearby space where the pullof gravity between the Earth, moon and sun is balanced. Augustine agreed with most human spaceflight advocates thatbelieve the ultimate goal is to put humans on Mars, but he made clear the paneldoesn't believe we are technologically prepared to go directly there. What the report has made clear is that for humans to moveout into the solar system, billions of dollars more are going to be needed.Underlying the panel's report and the discussions of destinations and cost, isthe basic question: Why fly humans into space? Augustine conceded that human spaceflight can't be justifiedby the science, technology or other direct developments that result fromsending humans into the void. "You have to go to a higher calling,"to justify the program he said. "Science is never the primary reason for sending humansinto space, so if you?re going to do it, you?re doing it for other reasons,?said David Mindell, the director of the Space, Policy and Society ResearchGroup at MIT in Cambridge, Mass. Mindell chaired a MIT study that helped todefine objectives that could only be accomplished through human spaceflight,including exploration, national pride and international prestige andleadership. Science, economic development, new technologies and education wereall ranked as secondary objectives by the MIT study. ?It?s a value judgment,?Mindell said. Augustine has repeatedly said that whatever funding Congressdecides upon for NASA?s human spaceflight program, it is important that afirewall be constructed between that program and the science programs.Scientists have complained repeatedly over the years that the space agency hasshifted money away from unmanned scientific missions to help cover theshortfalls in the human spaceflight program. As for the possibility that the Obama administration andCongress will stop sending humans into space, Mindell is skeptical. "Idon?t think that is going to happen. No president is willing to end it. We haveto assume there will be a human spaceflight program, so the question is, 'Whatis the right program?'" he said. Augustine said the White House has received the report, andthat the committee would be available for discussion. "We won't belobbying for any of this," he said. The administration said that they would review thecommittee's analysis, but ultimately, it falls to President Obama to decidewhich of the panel's options -- all of them expensive -- to follow. What to Watch For During NASA's Ares I-X Rocket Test? SPACE.com will provide full coverage of NASA's Ares I-Xtest flight with Staff Writer Clara Moskowitz in Cape Canaveral, Fla., and Managing Editor Tariq Malik in New York. Click here for livelaunch coverage and mission coverage. Live updates begin Tuesday at 5 a.m. EDT(0900 GMT).